From glistening lakes, meadows, dense forests, a National Park and an undeveloped coastline, to quaint rural hamlets to historical settlements, there is much to recommend Småland as the perfect choice for a Scandinavian touring holiday. On arrival at Gothenburg Landvetter airport, collect your hire car and drive to Möckelsnäs Herrgård. As soon as you leave the outskirts of Gothenburg, the landscape changes and you can feel the pace of life slow. Nature takes over and calm envelopes. Take your time, stopping en route to take in your surroundings. Overnight at Möckelsnäs Herrgård in Diö. Free time around Lake Möckeln in the southern district of Småland. This is a destination for nature lovers and outdoor enthusiasts with activities such as cycling, canoeing, horse-riding, fishing, wild swimming and hiking available in abundance. Within striking distance of your hotel is the IKEA museum in Almhult (guided tours available daily in July and August). The museum details the origins and concept of this world-famous, Swedish brand as well as reflecting on the history of furniture making in Småland, an industry for which this region is renowned. Today, you will drive to Kosta in the north-eastern district of the lakes. En route stop at Växjö on the shores of Helgasjön lake, Lake Växjö and Lake Trummen, considered one of the greenest towns in Europe. Glass has been manufactured in Småland since 1742 and is an important part of Sweden’s cultural heritage. Växjö is located in the heart of the ‘Kingdom of Glass’ and is home to the Swedish Glass Museum. The museum houses around 40,000 items of glassware and is worthy of a visit. Overnight at Kosta Lodge in Kosta. Day at leisure. Why not head to the coast and explore east Sweden’s sandy beaches and island archipelago? The historical, waterside town of Kalmar has a relaxed atmosphere and is perfect for a gentle amble. If you wish to venture further afield cross the bridge from Kalmar to the island of Öland, the smallest province in Sweden and a renowned summer paradise. Your destination today is Hestra on the shores of the River Nissan. Detour via the town of Jönkö-ping on Lake Vättern, Europe’s sixth largest lake. Overnight at Hestraviken in Hestra. Hestraviken is a destination in its own right, offering guests a getaway in the forests - you cannot help but to unwind here. As you spend your free time you may want to take a leisurely walk through the trees and forage for berries and mushrooms. Continuing your free time, you may wish to hire a bicycle or canoe and explore the peaceful waterways. Or, alternatively, use the hotel’s swimming pool (summer months) or try wild swimming. Nearby is Isaberg GK’s 36 hole golf course and the Store Mosse National Park. After breakfast, drive to Gothenburg Landvetter airport for your return flight to the UK. There are few places in Sweden, that we have discovered, that are as idyllically situated as Möckelsnäs Herrgård. On the shores of Lake Möckeln and backed by forests and Kronan Nature Reserve, this characterful manor house is the perfect choice for those wishing to relax amidst a calm and unspoiled environment. Owner-managed by Marina and Edwin, the accommodation offered is simple but the level of service and quality of food elevates the property to its 3+ star status. There is an air of grandeur to the public areas with leather Chesterfield sofas and pictures of the building from times past and, in the summer months, a lakeside terrace. Lake Möckeln is rich in birdlife and its surrounding forest is an attractive nesting site for species such as the lesser spotted woodpecker and the red-breasted flycatcher. Osprey and black-throated diver plus migrating common merganser, whooper swan and white-tailed eagle can be spotted here. Walking and wild swimming are popular past-times for guests, with marked trails available through the nature reserve and along the lake front, and nearby, in Älmhult, you can hire bicycles and canoes. Attractions include the Linnaeus Råshult culture reserve and local heritage museum (6km), the IKEA museum (13km) and the Kingdom of Crystal (66km). 46 rooms including single, standard, family and superior rooms housed in an annexe close to the main building. Kosta Lodge prides itself as being the ‘basecamp of Småland', surrounded by nature and close to the region’s famous glassworks. The desire is to provide comfortable accommodation where the guests can embrace the calm of the surroundings and feel at home. The grounds include two artificial lakes, lawns, trails and an outdoor swimming pool, and as such attract families in the summer months. If you think about Sweden images of forests, lakes and idyllically-situated, red wooden houses are likely to spring to mind. 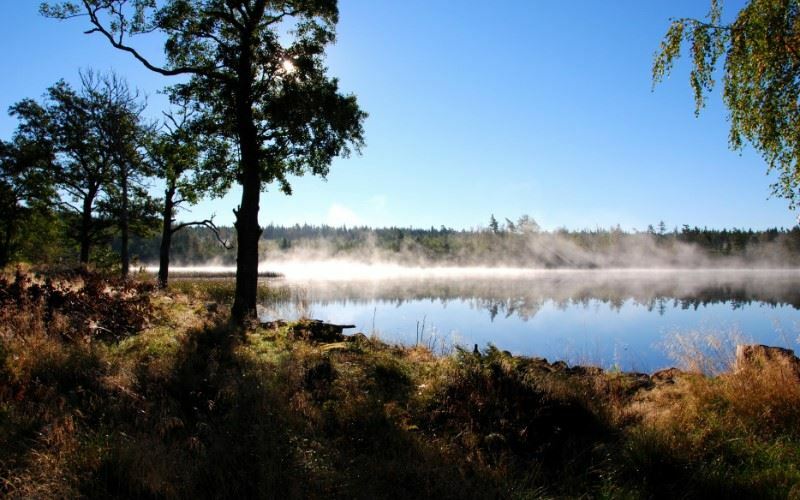 These sights and attractions are available in abundance in Småland. Explore the region on foot, by bike, by canoe or by touring with your car, the choice is yours. Cultural attractions in the area include Eksjö, one of Europe’s best preserved wooden towns; Kosta Boda, Sweden’s oldest glassworks dating from 1742; Kalmar Castle; Huseby Bruk; the IKEA museum and Astrid Lindgren’s World. A favourite of the Sunvil team and our clients, Hestraviken offers modern accommodation in a countryside setting, just 90 minutes' drive from Gothenburg. A favourite of the Sunvil team and our clients, Hestraviken offers modern accommodation in a countryside setting, just 90-minutes' drive from Gothenburg. Set along the shores of the River Nissan the property offers an excellent standard accommodation and uses contemporary designs to allow its natural surroundings and natural light to flood into the rooms. The kitchen is the heart of Hestraviken, serving a sumptuous organic breakfast and evening meals designed around the region’s own pantry. In the autumn months, the surrounding countryside is awash with berries and mushrooms that you can forage for yourself. There are also many local food producers which have delicatessens and cafes - perfect for lunch. Smäland is often described as Sweden’s lake district. The rural scenery and unspoiled nature is truly wonderful; it alone is a reason to visit. 45km from Vandalorum art and design centre.